President Donald Trump generates excitement among his supporters. 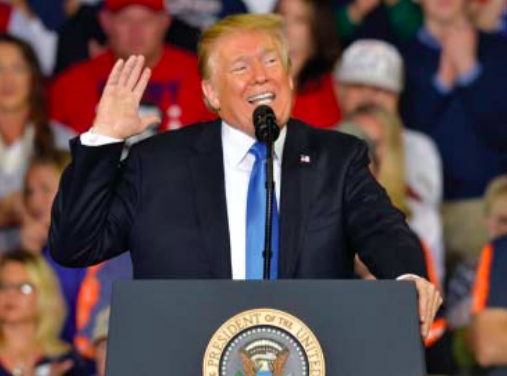 CROSBY – “It’s like the circus is coming to town!” exclaimed one Republican resident of the combined excitement and trepidation of having the presidential motorcade come to an unincorporated area that voted for him in the Presidential election by a whopping 74%. A flurry of questions poured into the Star-Courier concerning where folks could get a view or when traffic could be expected to be stopped on FM 2100 or Foley Road. 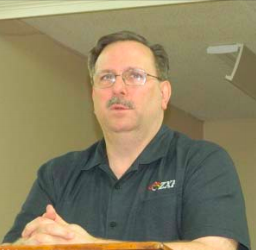 Arrival at the International Union of Operating Engineers International Training and Education Center comes in controversy. Presidential executive orders to facilitate making petrochemicals and speed up pipeline construction in the wake of four petrochemical fires in less than one month and the union facility recently became non-profit, thus reducing taxes paid to local first responders. White House officials announced the orders will grant incentives for investors to make an energy infrastructure, streamlining pipeline projects. Last May Trump issued a permit to initiate the delayed Keystone XL Pipeline. The International Training and Education Center is about 266 acres between Newport and Foley Road. President Trump indicated reducing red tape around pipelines would allow the US to remain undisputed leader of the world in natural gas and oil in the future. Of course, the new permit is under court challenge, environmentalists sued over the issue of Congress, not the executive branch, is granted constitutional rule over federal lands. 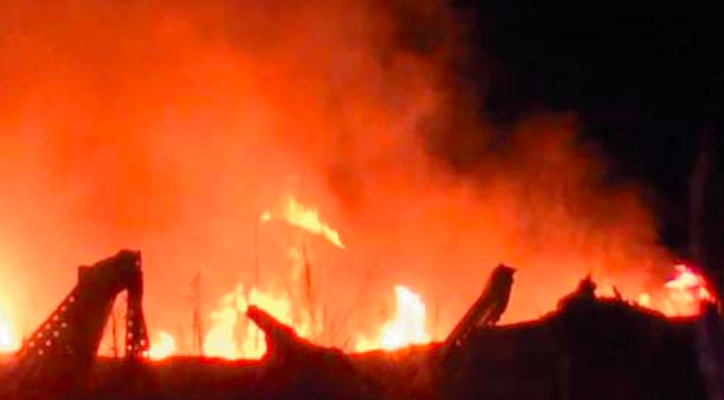 Only one day after the major fire at the KMCO plant in Crosby, the Crosby fire department was fighting another oil facility fire on Sralla Road. Crosby and Highlands fire departments were called out Wednesday night, May 3rd, after lightning struck storage tanks. Highlands Fire Chief Harvey Little said that the three storage tanks were completely destroyed by flames. He responded with a brush truck, because the facility is far from the road over unpaved fields. This is the same oil well that had a fire about one year ago. See page 8 for additional photos. (Photo by Lewis Spearman, Star-Courier). HIGHLANDS – Goose Creek school district is planning on a large $335 million bond issue to place before voters on election day, Saturday, May 4. 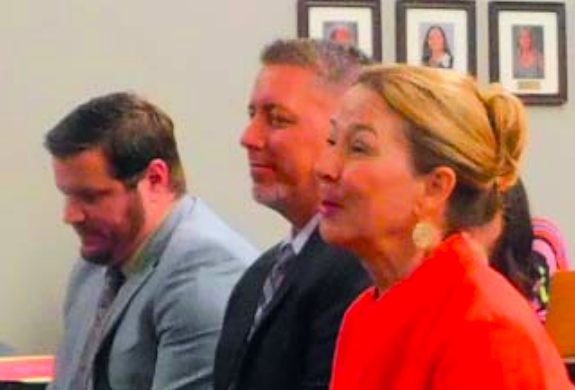 School superintendent Randall O’Brien, and others on a planning committee, have been meeting with civic groups and citizens throughout the district to explain the need for this large sum of money, and how it would be used. 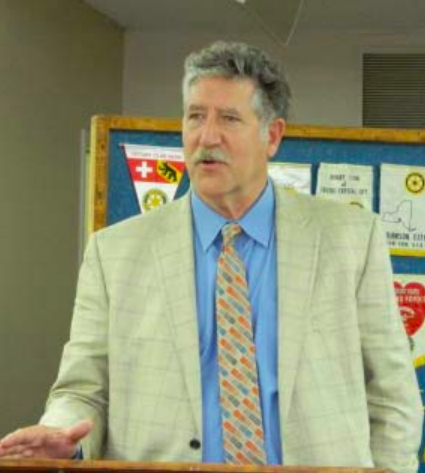 O’Brien spoke on Tuesday to the Highlands Rotary club, reviewing the history of the last bond issue in 2013, and the need for another one to keep up with the growth of the student population at present, and as projected into 2040. At that time, he said there would be another 6000 homes in the Baytown area, and those children must be accommodated properly. As superintendent, O’Brien does not officially take a position on the passage of the bond referendum, but only explains the scope of the vote and answers questions about what it would accomplish, and how much it would cost the average taxpayer. This is the second attempt at a bond issue to provide facilities and upgrades. Last year, a larger two part referendum was defeated, partially because it included about $50 million for a multi-purpose center that the taxpayers deemed not necessary. This year’s bond committee had 42 community leaders, and included some of last year’s critics. Their discussions refined the needs which would be included in the bond package. CROSBY – Shortly after 11:00 a.m. Tuesday many thought their buildings had been struck by a car because they were jarred violently, but it was the third of local plant fires in a couple of weeks, this time at KMCO, L.L.C. and this time it was deadly. Two employees were taken by ambulance to nearby Crosby Church for Lifeflight helicopters to pick them up. At least, another man was killed in the incident although at first was reported missing. By press time the names of the injured or deceased had not been released. A firefighter indicated that the two injured employees were in critical condition when found, having been burned over most of their bodies. No one would call the fire out before 5:00 p.m. although apparently considerably under more control by 2:30 p.m. Crosby VFD was first on the scene, followed by ESD#5, then Sheldon units. Crosby VFD encountered low water pressure (that same problem as had extended the fire in Deer Park on March 17 and 18.) No less than 16 fire tanker trucks of water from surrounding communities were brought in to contain the flames. According to John Foley, President and Chief Executive Officer of KMCO L.L.C., “There was an incident resulting in an ignition and fire today April 2, 2019 at KMCO, LLC in Crosby, Texas. We are deeply saddened to confirm at this time that there have been injuries and one fatality. Those injured have been transported for medical treatment. Our hearts and prayers go out to the individuals involved, as well as our first responders, employees, and our community. “We have activated the company’s emergency response team and incident command center. We are working with local first responders to extinguish the fire. We will give another update as additional information becomes available. 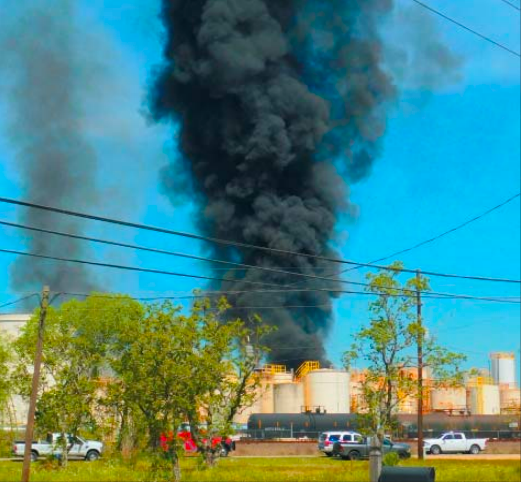 Later company officials reported that a fire was touched off by isobutylene then accelerated by ethanol and ethyl acrylate, a transfer line blazed, it caught a tank afire and the tank started a nearby building blazing that was packed with dry chemicals. 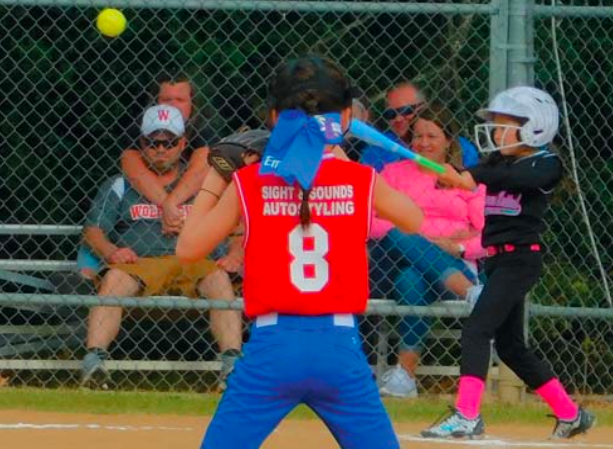 Last Saturday, a parade down Main St. and thronged ball parks signaled the beginning of baseball and softball season in Crosby and Highlands. HIGHLANDS – One of the oldest and largest businesses in Highlands is operating under new ownership and management, according to James Taylor, the new CEO. The company is now known as ZXP Technologies, and has a history of over 80 years in Highlands, when it was originally a canning factory for figs and fruit. Taylor spoke at a recent Rotary Club meeting, talking about the business success, and the work culture at the company. Taylor said that since his group took ownership in February 2018, they have seen business revenues increase by 50%. One key to this is focusing on their best customers. At one time they had 290 customers, and now they concentrate on only the top 10. Taylor spoke about the size of the business, which has 206 employees, and now has no “temporary” workers, a major change from previous policy. He said this has improved attitudes and work efficiency. The company also has instituted continuing education opportunities for all employees, and raised pay for everyone. Taylor has instilled the workers with a sense of responsibility for their work product. The company’s products include lubricants, transmission fluids, and antifreeze. 60% of their products are exported in bulk, he noted. HOUSTON, Texas – The Washburn Tunnel will be closed for 10 days, beginning at 8 p.m. on Friday, March 29th to 4 a.m. on Monday, April 8th. During this time, crews will be conducting in-depth maintenance to the Tunnel lining as part of the Washburn Tunnel Concrete Repairs project, which was planned proactively to preserve the life of the Tunnel. The Environmental Protection Agency, TCEQ, and the Harris County Pollution Control are closely watching air quality. So far, all agencies are saying the dark black smoke blanketing the region isn’t as dangerous as it looks, even as plumes envelop the county.